This is the hand of indian president pranap mukerji. here you can see the bow sign. This bow sign is same way present in 2 other person ( which i have seen some years back) Former president pradeepa patel and one british queen ( i forgot the name). If anyone find their hand picture, please post it here. Bow is the sign of King's authority. Thus, This sign found in the some president's hand. however, pranap mukerji has crooked mercury finger . This shows that his political corruptions. This crooked little finger also found in cricket player Azaruddin who was well known for match fixing and corruption. I can see it's form has the appearance of a bow which is where it probably got its name. I've seen this formation on a number of people who are not anyone in particular. But, as it creates a major block to influence lines moving through, I can imagine the owners take orders from no one. So the energy could be a fitting one. At least attitude wise. I have the same features of bow in my right palm. I have seen this in quite a few palms of ordinary people. 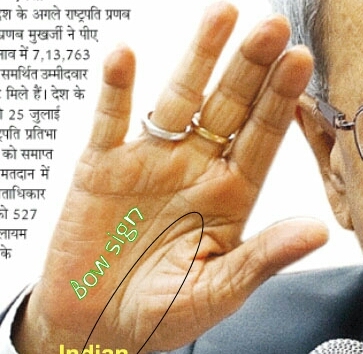 anithapalm wrote: This is the hand of indian president pranap mukerji. here you can see the bow sign. This bow sign is same way present in 2 other person ( which i have seen some years back) Former president pradeepa patel and one british queen ( i forgot the name). If anyone find their hand picture, please post it here. Bow is the sign of King's authority. Thus, This sign found in the some president's hand. however, pranap mukerji has crooked mercury finger . This shows that his political corruptions. This crooked little finger also found in cricket player Azaruddin who was well known for match fixing and corruption. Is the Bow-Sign correctly marked in above pic?